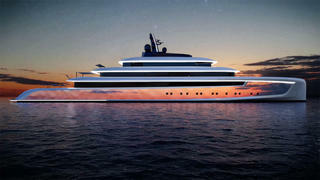 Van Geest Design made headlines earlier this year by unveiling a 90 metre concept for Oceanco that featured a shimmering exterior developed in collaboration with Temeloy Advanced Lighting Design. Speaking at the time, designer Pieter van Geest said: “The inspiration for Moonstone was basically nature. Normally boats look like they disturb the horizon — we wanted to make something that actually belongs.” However, this is just one of the four ways in which Project Moonstone can blend into her natural environment. 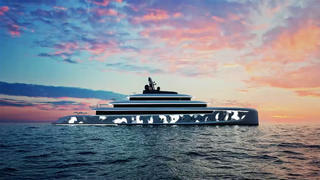 Van Geest Design made headlines earlier this year by unveiling a 90 metre concept for Oceanco that featured a shimmering exterior developed in collaboration with Temeloy Advanced Lighting Design. However, this is just one of the four ways in which Project Moonstone can blend into her natural environment. It’s not just the rippling of the waves that Moonstone can reflect, as this rendering shows. The full colour exterior lighting is controllable by the owner’s mobile phone and features a camouflage mode, which can reflect the beauty of a stunning sunset. The lightshow doesn’t need to stop when the sun goes down, however, as this rendering shows. Moonstone’s lighting design is sophisticated enough to capture starlight and constellations for a spectacular night-time light show. “It will be incredible because the owner will have the possibility to have a new boat every day,” Treins added. Or should they choose to charter it out, Project Moonstone would make an ideal charter party yacht. The lightshow doesn’t need to stop when the sun goes down, however, as this rendering shows. Moonstone’s lighting design is sophisticated enough to capture starlight and constellations for a spectacular night-time light show. “It will be incredible because the owner will have the possibility to have a new boat every day,” Treins added. 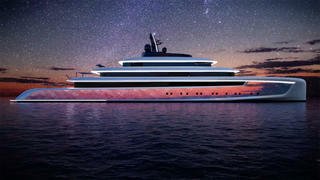 Or should they choose to charter it out, Project Moonstone would make an ideal charter party yacht. 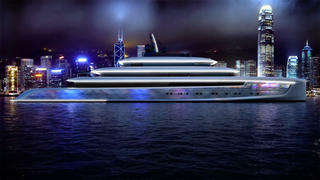 Based on the proven 90 metre Oceanco superyacht platform, Project Moonstone is ready to be built immediately. And with the long-range cruising potential of a twin MTU 20V4000 M73L engine set-up, owners can expect to cruise far a wide to exotic destinations. Upon arrival, the exterior lighting system can adapt once again to reflect its environment, as this twinkling cityscape shows. Based on the proven 90 metre Oceanco superyacht platform, Project Moonstone is ready to be built immediately. And with the long-range cruising potential of a twin MTU 20V4000 M73L engine set-up, owners can expect to cruise far a wide to exotic destinations. Upon arrival, the exterior lighting system can adapt once again to reflect its environment, as this twinkling cityscape shows.